Unite the Union and Len McClusky talking about 650 Ryanair contracted Cabin crew who are paid well, what about the exploited ,intimidate and Zero Hour 2,850 other agency cabin crew through Crewlink Ireland and Workforce International ??????. 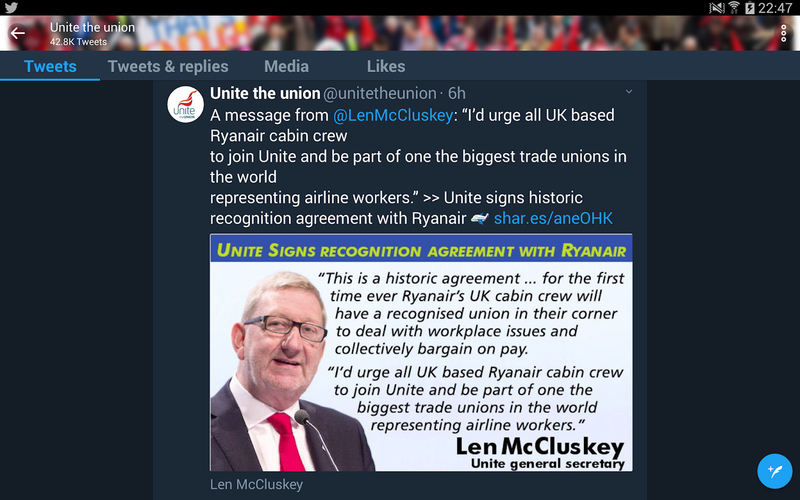 Nothing historical here...... Unite the Union and Len McClusky talking about 650 Ryanair contracted Cabin crew who are paid well, what about the exploited ,intimidate and Zero Hour 2,850 other agency cabin crew through Crewlink Ireland and Workforce International ??????. Nothing historical here...... Paying these agency UK cabin crew below minimum wage, two Government investigation on going....Unite the Union and Len McClusky doing a great spin story here which benefits Ryanair Scum bags David Bonderman and Michael O'Leary... Crew themselves have taken a great step forward over last 10 months in achieving union recognition, industrial action in my eye's has been a great success story but should have gone much further.The sickness is contained (management) at Ryanair for now but can return at any point.Unite the Union have failed miserably,ask Pilot James Anderson and Len McClusky talked a good game but can he deliver for the thousands of PROBATIONARY cabin crew who still live and work under a shambolic contract with Crewlink Ireland and Workforce International... https://youtu.be/KIu7d6j3zAo We must always learn to forgive but never forget what Ryanair Management have done to thousands of Pilots and Cabin Crew and a special thought for Pilot Paul Ridgard. Respect and Dignity to Pilots and Cabin Crew.